It’s an unfortunate and unfair thing, but when it comes to Canadian movies, I usually dismiss them before I give them a chance. There’s just this false stigma that I have with Canadian produced movies – that they’re cheesy or boring or in general, just not worth my time. That said, if a friend recommends me something, I’ll be open to the recommendation. Incendies would be one of those, and wow, I don’t know if I can look at Canadian films the same way after this. This was a powerful movie. Incendies is a French-Canadian made movie that was nominated for an Academy Award this year for best foreign film. When I first read the nominations, I thought it peculiar that a Canadian film would be considered “foreign”. Sure we’re not American, but all things considered, we’re not THAT different or foreign. But after seeing the movie, it totally makes sense why it would. Incendies is a journey that follows twins, Simon and Jeanne, as they uncover the dark past of their dying mother. Her dying request is for the twins to deliver letters to their alleged father and a long lost brother. With their detective caps on, they travel to the Middle East to put together the puzzle that is their mother’s past life. It’s a past that’s filled with darkness and depravity, and one that unfortunately connects with their births. Incendies is gritty and it is violent; a cold blooded sort of violence that you don’t typically see. Once the reel rolls, there is no letting down and nary a lighthearted moment. It is a bleak and emotional story. What I really liked about the movie was director Denis Villeneuve’s approach to the content. Much of the time, we don’t see the evil acts on screen. We see the before and we see the after – he allows our imaginations to fill in the rest. The movie is presented about half in flashbacks and half during present day. Although the base for the movie is in Quebec, the majority of the movie takes place in the Middle East. The cinematography is breathtaking, with a tone that perfectly matches the context of the movie. The movie has this raw and rugged feel that looks immaculate in digital projection. Adding to the atmosphere are the strategically placed Radiohead songs that are interlaced with key scenes. Incendies is a breath of fresh air amongst the vapid choices out in the cinemas nowadays. Despite the bleakness of the story, I feel proud that it’s a Canadian made movie. It’s a reminder to myself that we too are capable of goodness! I don’t think it’s playing at many screens out there, but if you’re living in Toronto, it’s playing at the TIFF Bell Lightbox (thanks Elyse for the connection!). See good filmmaking. See good Canadian filmmaking. 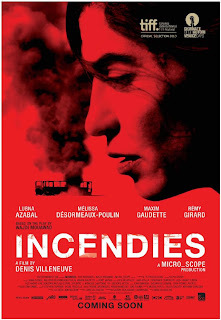 See Incendies. Until next time, later geeks!